The beautiful riverside Hampton Court Palace started off as a manor that was built for the Knights Hospitallers of St John Jerusalem in the 13th century. The manor was the central part of a large farm estate which had been designed to provide money to support crusaders in the Holy Land. In 1514 Cardinal Thomas Wolsey obtained the palace on a 99 year lease and began transforming it from a private house into a huge palace complex fit for a king. Wolsey built the palace to impress the whole of Europe and it was a wonderful fusion of Catholic iconography and Renaissance art and architecture, with an incredible “long gallery”, a huge new entrance courtyard, new chapel and cloister, and hundreds of fine tapestries. 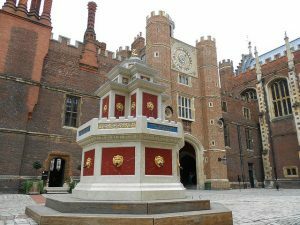 When Cardinal Wolsey fell from royal favour in 1529, Henry VIII took possession of the palace, and he and his intended bride, Anne Boleyn, spent the equivalent of many millions of pounds in today’s money (some say 18 million! ), turning Hampton Court into the palace of their dreams. As well as entertaining the royal court and providing a home for Henry VIII, Anne Boleyn and Henry’s subsequent wives, the palace was also the setting of key events in Tudor history – the birth of Edward VI (son of Jane Seymour and Henry VIII), the death of Jane Seymour from suspected puerperal fever, the house arrest of Catherine Howard, the marriage of Henry VIII and Catherine Parr, Mary I’s acceptance of Philip II of Spain’s marriage proposal and her confinement in 1555.